Welcome to my blog! Today, I am starting a new series here and I hope you will stop each Sunday, Tuesday and Thursday to see what's happening. Each week, I will feature a new stamp set and I will show a new card or project for a total of 3 different designs from that stamp set. I will post the first design on Sunday, the second design on Tuesday and the final design on Thursday. My purpose is to share with you how a few products and one stamp set can create really cute cards and projects. This set is absolutely adorable. You can create all sorts of birthday wishes with the multiple word stamps included with the set, some script and some print. I love this set! And check out the adorable designer paper! That's from the "Cherry on Top" DSP stack found in the catalog. It's so colorful and fun. I love it! To create this card, I cut a piece of Tip Top Taupe cardstock at 5 1/2"x 8 1/2" and scored it at 4 1/4" to create the card base. Then, using the circle framelits collection, I used the 4th circle counting from the inside smallest outward and cut one circle from the Cherry on Top DSP, one from the Watermelon Wonder CS, the Soft Sky CS and the Whisper White Cs. I then inked up the cake image from the Endless Birthday Wishes using the Soft Sky ink and stamped it onto the Whisper White circle. I added Basic Rhinestones to the candles for a little bling and then I inked up the print "happy" with Tip Top Taupe ink and stamped it to the bottom left of the cake image, then I inked up the script "birthday" also with Tip Top Taupe ink and stamped it beneath the "happy". 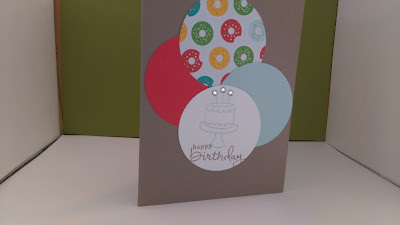 Here are the supplies that I uses to create this cute birthday card. Please let me know what you think. Project Life "Remember This" as a Wedding Card?